Lighting comparisons are extremely difficult to make because if a typically wired AC home with all incandescent lights are analyzed, one type of power usage is required. If compact florescent light bulbs are used, a different power usage is required. If all LED bulbs are installed still another power usage can be documented. Of course, if you have a combination of incandescent, florescence and LED’s, which is what is normally found today in homes, energy usage can be totally different again. For all of these reasons it is most challenging to make a comparison, but here are a few things to consider. Ours: PMMI Lighting runs fixtures and bulbs on constant current supplies, with these supplies being located in the central lighting panel, NOT in the fixture. Power and Control comes from that central lighting panel. Theirs: Most 120vac LED systems have the electronic constant current or constant voltage supply built right into the fixture or bulb. Ours: PMMI Lighting LEDs run in parallel, when one pad goes out, the fixture continues to work. Theirs: Almost all fixtures or bulbs on the market have the LEDs arranged in series. When one pad goes out, the whole fixture goes out. Ours: DC Powered. Wired and powered with Cat5/6 Cable, running at 1/3 of rated power. PMMI Lighting’s low voltage systems will probably only draw 10% as much power as a standard AC incandescent system. 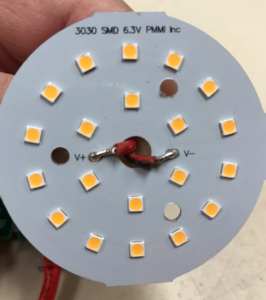 If you go to the best LED system you can find, our system is probably only going to draw 2/3 maybe 1/2 as much power as that, so we’re extremely efficient. Theirs: AC Powered. Wired with Romex, running at full power. Ours: Running at 1/3 rated power, outputting the SAME as if run at full power. Theirs: When a LED is run at full power, it emits less lumens per watt than when run at a lower power. Ours: Our fixtures run very cool, usually about 100 degrees F, not 180 degrees F. By running the fixtures at very low power, they run very cool. If a driver were to fail, it is replaceable in the central panel and the fixture is not compromised. So the light fixture, the LED emitters, just barely get warm and they will last infinitely longer in our fixtures than they will in an AC system where they are running full power. Theirs: When LEDs are run at full power, they also develop the most heat. Since the electronics are built into the fixture, it is also exposed to this high heat. The life span of LEDs and electronics are reduced when exposed to high heat. A lot of the bulbs and can fixtures that we have tested run as hot as 180 degrees F. This can lead to a rather short life if the fixture cannot be adequately cooled, sometimes as short as a year to a year and a half. Ours: You have a complete smart home system. Controllable with a screen and keyboard directly connected to the system, via VNC Viewer, with our android Ap, or Alexa. PMMI Lighting’s System is fully programmable using a simple excel spread sheet. Following is a schematic of how our LEDs are connected in parallel in the fixture. 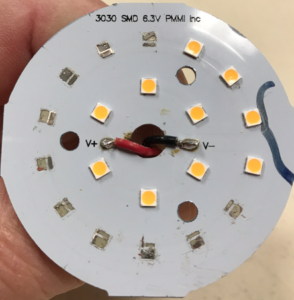 Shows an LED array, used in PMMI Lighting’s standard downlight with all of the LEDs attached. This is a 6 watt array, but is capable of running about 18 watts. The second picture shows half of the LEDs destroyed, however the LED array still emits the same light as the array in the first picture. The only difference is that the LEDs are running at a little higher current. Fixture is NOT compromised. The normal drive current for the LEDs used in our fixtures is 150 ma and emits about 130 lumens of light per watt. However, you can see from the chart shown below that as we lower the drive current, the light output increases to 171 lumens per watt at a drive current of 30ma. Our lights are far more efficient that those used in the 120vac system. It’s a real complex comparison, almost impossible to make. From feedback from customers, we do know users are happy with their energy consumption or lack there of. Customers are also thrilled with the controllability of the system.